VINALHAVEN, Maine — Three white wind turbines, their 124-foot blades stretching 39 stories high, churn out more electricity than is used on this picturesque, pine-studded island off mid-coast Maine. Some residents call them objects of graceful art, others point to lower utility bills, and the environmentally conscious hail the benefits of clean energy. But to some families living near the land-bound turbines, which began spinning in November, the blades signify something else. Instead of a win-win mix of green power and continued tranquility, Wylie and other critics said, the turbines have brought chest-thumping noise, questionable cost savings, and frustrating stonewalling from wind farm managers who reject their claims of night-rattling sound. “It feels like we’re the guinea pigs for an experiment in public policy,’’ said Alan Farago, 56, a summer resi dent of Vinalhaven who also lives in Coral Gables, Fla. The complaints have stoked a running argument with the Fox Islands Electric Cooperative, a ratepayer-owned entity that operates what is the largest coastal wind farm in New England. And they have fallen on deaf ears among most of the island’s 1,200 year-round residents, who are seeing an average annual savings of $300 in their electric bills, according to the cooperative. In July 2008, ratepayers voted, 383 to 5, to endorse the wind farm. That near-unanimous majority included many of today’s critics, who backed the effort despite its proximity to homes and families. The 130-turbine Cape Wind project in Massachusetts, by contrast, provoked a storm of controversy even though the offshore project is planned to be built 5 miles from Cape Cod. “It doesn’t bother me none,’’ said George Gross, a 51-year-old lobsterman, as he worked on the harbor a couple of miles from the wind farm. Charles Farrington, the cooperative’s general manager, asserted that the turbines comply with the state’s maximum noise limit of 45 decibels at night and 55 decibels during the day, or roughly the level of quiet to normal conversation. On one recent morning, the turbines rotated slowly in a gentle breeze, generating only a slight, pulsating sound that seemed more innocuous than intrusive. But this snapshot, said Art Lindgren, who lives about a half-mile away, is an anomaly. The previous night, when a strong storm raked the island, the sound of the turbines was an aggressive intruder at his hand-built home, Lindgren said. The noise, Farago said, is a three-headed monster: There’s a whir, there’s a whoosh, and there’s a pulse like the bass from an annoying car radio. “I think we were all sold a bill of goods and hoodwinked into doing this,’’ said Lindgren, 64, a retired software consultant who dashes outdoors at least twice a week to measure noise levels with self-bought equipment. Lindgren said he has recorded 49 decibels on his porch. In sound measurement, every 10 decibels represents a 10-fold increase. The neighbors are fighting back with their own measurements, more than a dozen complaints filed with the state, and the services of an attorney. So far, Farrington countered, the $15 million project has met its obligations, both environmentally and aesthetically, for an island where electric rates were nearly double the mainland costs before the turbines began turning. 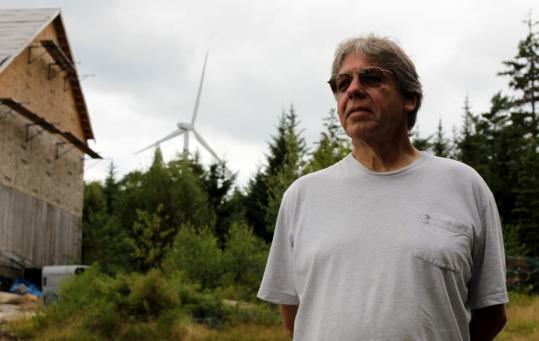 George Baker, the chief executive officer of Fox Islands Wind, which developed and financed the project, said the controversy has pitted neighbor against neighbor and raised costs for the cooperative because of the labor-intensive investigations that follow each complaint. Project managers are collecting a year’s worth of noise data, scheduled to conclude in December, to measure whether the wind farm’s predictions were correct. In a country looking to decrease its dependence on imported fossil fuels, Maine is a regional leader in wind power, with 111 turbines spread among six sites from Vinalhaven to far-north Aroostook County. In a state where 75 percent of the homes are heated by oil, the promotion of clean energy has been a priority of Governor John Baldacci. “Maine’s wind power resource is among the best in New England, and there is tremendous potential out there to develop offshore wind,’’ said David Farmer, Baldacci’s deputy chief of staff. “The overarching goals are to achieve energy independence to the largest extent,’’ said Andrew Fisk, bureau director of land and water quality for the Maine Department of Environmental Protection. But for the critics on Vinalhaven, the public benefits of wind power have become a private curse.